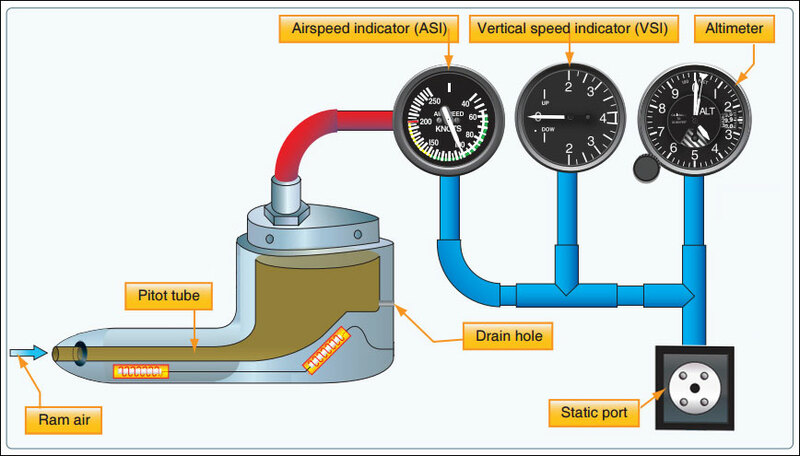 The pitot-static system operates the airspeed indicator, altimeter, and vertical speed indicator. An obstructed pitot tube (ram air) only affects the airspeed indicator. Air pressure is measured in inches of mercury. The atomic symbol for the element mercury is Hg. Pressure altitude is the height above the standard datum plane (29.92" Hg). Density altitude is pressure altitude corrected for non-standard temperature. Under standard conditions, pressure altitude and density altitude are equal. Pressure altitude can be determined by setting the altimeter to 29.92. Air pressure decreases by roughly 1" Hg per thousand feet of altitude gained. An altimeter will read higher in colder than standard air temperature. Prior to flight the altimeter must be checked for accuracy. When set to the local barometric pressure it should read within 75 feet of actual field elevation. If local barometric pressure is not available, set the altimeter for the field elevation. If, prior to flight, the VSI indicates a small climb or descent, flight is still allowed and the indicated value should be used as the instrument's zero position.